West Caldwell, N.J. – His memory serves Lantz Gleisner well. 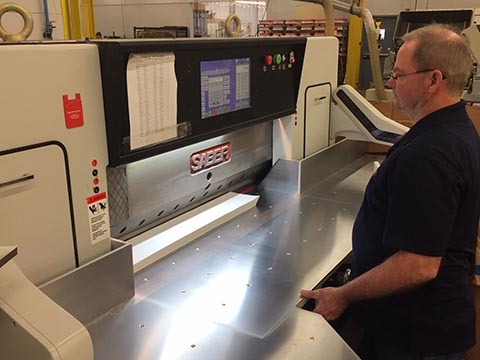 The director of print operations for The YGS Group, a York, Pennsylvania based total solutions provider, was in need of a new paper cutter last year. That’s when he recalled having good luck years earlier with a SABER® machine when he worked at a different company. The experience would eventually lead to the installation last October of a new 45-inch SABER X-15 with Microcut® from Colter & Peterson, a decision that impacts work at the company every day. It is a 24/7 operation with no downtime, which factored into Gleisner’s decision to choose the SABER. In the past year, Gleisner says the amount of digital jobs YGS does has grown to account for between 30-40 percent of the overall work. The SABER and a smaller 36-inch PRISM® unit cut all of the work produced by three sheetfed presses and three HP Indigo digital presses. YGS is known for its short run capability, but for the most part, Gleisner says it can range from 1-50,000.